Laura earned her undergraduate degree from the The Ohio State University, her Masters from Iowa State University and Ph.D. from the University of Nebraska. 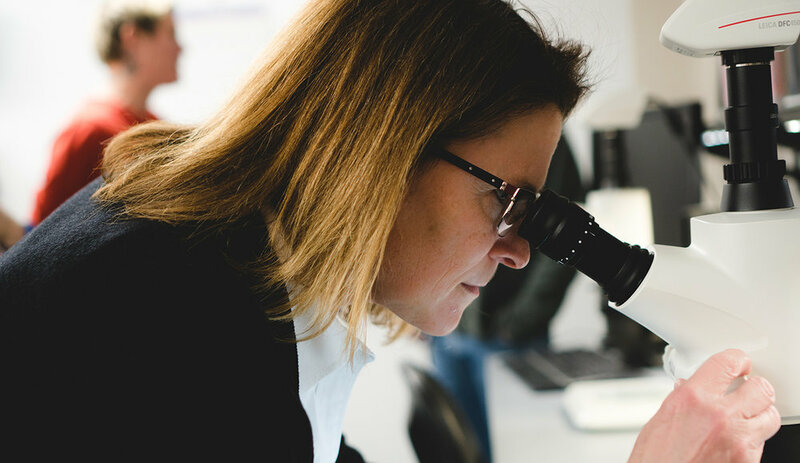 She began her career at Pioneer (now part of Corteva Agriscience™, Agriculture Division of DowDuPont) 27 years ago and has worked her way through nearly every level of the research organization. An entomologist and passionate advocate for science literacy, Laura serves on the Board of Directors for the Science Center of Iowa and leads a STEM-focused Girl Scout group. Describe the path you took to get to where you are now. The path I took to get to where I am today was largely unplanned. I wasn’t a kid who loved to play with bugs, so to end up having a career in entomology surprises even me sometimes! When I started at Pioneer 26 years ago, I met amazing scientists who were so enthusiastic about the work they did, you couldn't help but kind of “catch the bug” of entomology. They were inspirational, they mentored me and took me under their wing. I became equally enthusiastic and started down the path towards being a scientist in the world of entomology. My undergraduate degree was from the The Ohio State University and in those days I'm not sure I could have told you what an entomologist did-- it was definitely not on my radar. I graduated with an emphasis in meat science and took my first job in the Sioux City area. After moving to Des Moines with my husband a few years later, I answered an ad in the paper to work for Pioneer. I started with Pioneer as a part-time employee to help with basic research tasks and 26 years later, I've worked my way through almost every level in the research organization to research director. I feel like I've been in this really incredible incubator of professional development and it has felt that way my whole career. I did my graduate work while I was working full-time at Pioneer and got great support from my employer. What was so thrilling to me, was that everything I was learning in the classroom was completely applicable real-time to what I was doing at work. That's a really exciting place to be: a steep learning curve and every day you're learning something new. It's nice for me now to be able to help create that environment for new professionals coming into the organization. Your education does more than teach you how to learn facts from a book. It teaches you how to ask questions and solve problems. It also helps you network with professionals and gives you mentoring opportunities that you would not get otherwise. I didn't absolutely love school - I did well at school but I never saw myself as someone who would get a Ph.D. eventually. It was through great mentoring from colleagues and my academic contacts that encouraged me to take those roles. My formal and experiential education have been (and continue to be) important because we must never stop learning. Tell us a little bit about your current role and what you do for DuPont Pioneer, as part of what is now Corteva Agriscience™, Agriculture Division of DowDuPont™? In my current role I lead the Integrated Field Sciences Operational and Scientific Excellence group. Our teams provide operational support for field scientists around the globe. The goal of the Integrated Field Sciences group is to characterize the performance of our technologies and products and be on the forefront of designing new products and integrated solutions for growers. We want to provide our customers with innovative, robust, sustainable solutions to drive their productivity. Can you tell us a little bit about what some of those products do? You talk about supporting teams across the world. What are those products they’re working on? Integrated Field Sciences is at the confluence where seeds, traits and crop protection products come together to be tested. We are characterizing both the individual components developed by our discovery and product development teams as well as integrated solutions. Growers face many challenges in the field, so we seek innovative combinations of technologies to help make our growers more successful. What kind of exciting projects are you are currently leading? As an entomologist, one of the areas that is really exciting today is developing new integrated solutions for pest management. This isn’t a new concept, but the tools we can use to improve pest management are always evolving (as are the pests!). And it’s not just about developing new technology. We are leveraging things like computer simulation models to understand the most effective ways to use combinations of technologies and management practices, and understanding the economic impact and benefits to growers by implementing these plans. Implementing integrated pest management programs can help extend the usefulness of the technologies we’ve developed and can give growers more sustainable pest management solutions. How does creativity and problem solving integrate into your current role? Problem solving, especially in an operational role, is incredibly important. It's so satisfying to have somebody come to you with whatever issue is preventing them from being successful in their role and being able to help them remove that barrier. That's one of the benefits of being in the organization for as long as I have is that you've got some broad understanding of how the organization works and who to contact for specific problems. Get the right people together to solve the problem and you can be successful 99% of the time. Can you talk a little bit about the new brand and what that means to your role and to the organization? I'm super excited about the new organization-- even the name excites me! 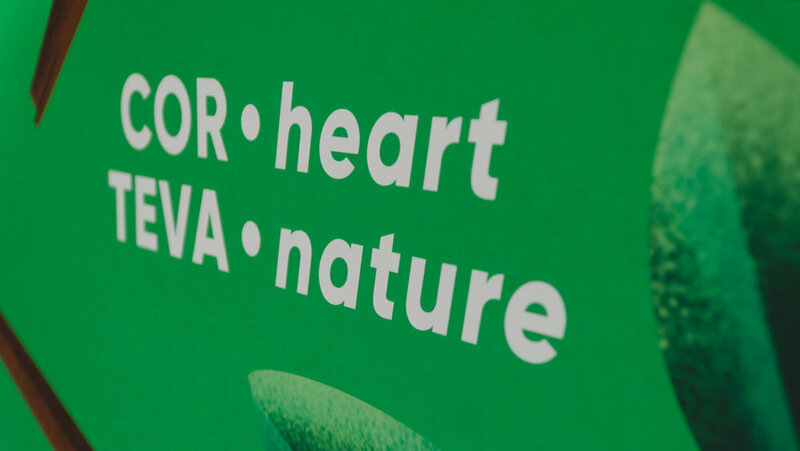 If you pull apart what Corteva means it’s “core” or “heart of” and “teva” is “nature.” Our organization is full of people who care deeply about agriculture and food security. We care deeply about the environment and we care about sustainability. Our new company name and purpose capture these core values and who we want to be. It's exciting because we care deeply about our customers, we care about our science, and we care about sustainable solutions for the long haul, developing solutions for growers around the globe. What is an achievement or discovery you’re most proud of? The thing that comes to mind was my involvement with insect resistance management programs: things like our AcreMax program or our integrated refuge program. It was a fulfilling project to be able to deliver an integrated refuge solution that made growers’ lives simpler and helped extend the life of our products. We were the first on the market with an integrated refuge product and virtually every seed company now uses an integrated refuge concept. They’re not universal - not one strategy is appropriate for every situation and they have to be customized based on where you are in the world, the insect pests, what technologies and practices are employed, and the products that you have available. What I was really excited about was that it was a great concept for the markets that we were trying to use it in and it's become an industry standard. Biggest risk you’ve taken in your career? This is probably not unique to me - I think a lot of people have this issue. After I entered into the workforce I was reluctant to take subsequent roles. People would come to me with an opportunity and I wasn't always that enthusiastic. To some extent, I doubted my ability to take on that next role. I always felt that when I did make the decision to take the next role, or walk into a space that I was a lot less familiar with, I felt kind of vulnerable and that's hard for me to do. That's hard for a lot of scientist to do. What's exciting about it is you find yourself in a steep learning curve and you have to reach out and learn fast, you have to network with people who are experts in that area and I love that. It’s a little terrifying and exciting all at the same time. If you can just get over the self doubt that holds you back, you can do amazing things. I look back and I say “wow, we did a lot of amazing work together” - the teams that I worked on. I'm so happy that I took those chances to join those teams. The person who hired me 26 years ago, Dr. John Campbell, was a great mentor to me. He was a wonderful professional. I've always felt really fortunate in my career to have people who took time to mentor me and coach me. People do try to help and coach, and if we’re listening, we can gain a lot of useful feedback from almost anybody that we work with. Almost every manager that I've had, I’ve considered to be a mentor. There are also people out there in the ether that I read about and have been really inspirational to me. People like Henry A. Wallace who started Pioneer; he understood better than anyone what agriculture and food security meant to stability in the world and I find that really inspirational. It brings a lot of personal meaning to the work I do everyday. There are mentors in our day-to-day lives, and there are people who inspire you that came before us. We stand on their shoulders. The founders of the companies that now make up our new organization left us with an amazing legacy that is now ours to do something with. We have a tremendous responsibility and opportunity before us. This new company is a change from the past, but I think we have similar goals to our founders. How does technology play a role in your work? Technology is everything in our work in a company like this. If we're doing the same thing we did 10 years ago, we're not doing our jobs very well. We have to advance solutions for food production and sustainability in a world whose needs are real and ever increasing. We have an obligation to be moving the science quickly and safely so we can to meet those needs sustainability. You’re very involved in the community outside of work. Can you please talk about what initiatives you’re most passionate about? One of the things I'm super excited about right now is a project with our internal Women’s Network group where we have kicked off a STEM-focused Girl Scout group that meets at our Johnston, Iowa campus once a month. We bring in fabulous women scientists to work with the girls with hands-on activities in their area or discipline of training. The girls get exposed to all kinds of career areas that they may not even know exist. Not only do they get to work with entomologists, but they're working with intellectual property attorneys, microbiologists, agronomists and engineers. It's great exposure for the girls. I read so much about how important it is for girls to meet and see women working in STEM areas in order for them to be able to visualize a career for themselves in those areas. I'm also super excited about the work that we do at the Science Center of Iowa. Pioneer has been involved as a corporate sponsor for Girls in Science programming at the Science Center and I'm on the board of directors. I’m a huge fan of SCI’s mission for engaging and inspiring a love of science. I'm down there a lot with girls in science programming and have been a part of their Portal to Public Scientists program as well. Being an entomologist gives me great tools to engage people on scientific topics – who doesn’t have a great bug story they want to talk about? What I really care about is a science-literate society. So many of the things we deal with in our society and politics have a scientific underpinning. I want people to be enthusiastic about science, appreciate it, learn where to get credible information about scientific topics so they can make informed decisions. Access to quality talent is a challenge for every industry in Iowa. How does the talent shortage or skills gap effect the ag industry in particular? Not having qualified candidates in the state or close to where we want to hire them means we have to cast a really wide net to find talent. That can be good and bad. Casting a broad net likely means bringing in more diversity than we might have found otherwise, but not having enough talent available also slows down hiring and your people are everything. We can’t innovate without have talented people in the organization who are excited about working in these fields. Along those lines, it sometimes feels like agriculture has some perception challenges. Ag may not have the glitzy appeal that some tech industries seem to offer. Some people may have a preconceived notion of what careers in agriculture look like, but if you dig even slightly below the surface, you can see just how much innovative technology is being leveraged in the agricultural space: genome editing, precision agriculture, digital agriculture, really tech-heavy areas. I’m sure many people don't really appreciate just how tech-savvy agriculture is. Companies like ours and initiatives that you’re [TAI] doing, help bring a modern view of agriculture and it’s opportunities. It's a different industry than it was 40 years ago, and it's rapidly evolving. We hope it's pulling in the top talent and we want to encourage top talent to think of agriculture as the first thing they want to go do. Because what could be more important than feeding the world? Agricultural careers are often aligned with a particular stereotype, how are you working to change those perceptions, particularly with women? I think the technology that we work on is one big carrot to put out there for people to get them excited about joining agricultural companies. Working on technology solutions that feed a growing population resonates really well for people who care about society and have a larger mission in mind. I think that's really attractive to women. A lot of the grassroots work that we do within the organization such as women’s networks and our employee resource groups are building an organization that is open and inclusive and helps support different lifestyles for our employees and for people that want to work here. The way that our parents and grandparents view work isn't necessarily how the modern workforce views work. It doesn't mean that we don't work hard, it doesn't mean that we aren’t incredibly dedicated - it's a different work model. Every generation has different things that motivate them in the workplace and we have to be responsive to that. We can't be the way we were 50 years ago. We have to employ a modern workforce with modern values and use tools to make these jobs attractive for women and for all people who come here. It's not just a question of whether we bring women to work at Corteva Agriscience™, it's about bringing a diverse workforce. Diversity comes in a lot of ways - it's not just gender. It’s cultural diversity, diversity of thinking, diversity of experience - that's who we want here, because that's how you solve problems. If we all thought alike we would never solve the problems we need to solve. What gets you excited about your role as a research leader? I'm super excited about the revolutionary technology that we have access to and its ability to change the game in agriculture. From a more personal perspective, at this point in my career I have a lot of energy for developing talent and motivating young scientists who want to come work here on these really important questions of food security and sustainability. We can improve everything that we do. It doesn't matter if you're in agriculture or any other industry, the goal of technology is to do what we do even better, more innovatively, more efficiently, more safely, or more sustainably. You are an environmentalist and an advocate for sustainability, how do those passions weave into your work and personal life? If you haven't noticed, I get really excited about the things that I do. I’m a mom, a wife, a daughter, a sister as well as being a scientist. As a scientist, as an entomologist, I care deeply about how food is produced. I care deeply about the environment. I care deeply about sustainable options for growers and improving how we produce food in the world. These things are really important not just to me, but to the people that I work with as well. We get up every morning thinking we're going to change the world. Your work has a global impact. Can you explain how the work of Corteva Agriscience™ extends well beyond American farmlands? We’ve come a long way in the last couple of decades working with growers outside just traditional North American farmers. We develop tools that can be leveraged globally and the most important thing is we're working locally with people and being mindful of their unique needs, their unique practices, and their individual situations. The special sauce is being able to deliver local solutions that are really adapted to the needs of every place that we touch around the globe. What sense of responsibility do you have to inspire and guide the next generation of leaders? I feel as you move through your career it really is your responsibility to make sure that the next generation of young professionals have great developmental opportunities, great mentorship opportunities, and great coaching, because I see what it's done in my own career. It's absolutely a part of what I have to do as a scientist in this organization to develop the next generation of scientists that will carry the work forward. What are some things you look forward to in the next five years? I look forward to seeing more diversity in agriculture and in our organization that represents the diversity in agriculture we see globally. That for me is really a top priority. We will do great science, I’m confident about that. I want us to bring more creative thinking on how we apply those solutions around the globe. If you were not a scientist, what other type of career would you be interested in? I love this question! So many things I’ve wanted to do. I think I'd be a meteorologist because I was scared of two things growing up: bugs and tornadoes. And I became an entomologist so I feel like I'm obliged go learn something about meteorology. Something about facing my fears: I was also afraid of cows so I ended up with a meat science specialization in my undergraduate program. So I guess there is some wisdom in learning everything you can about what scares you- you don’t fear what you understand. Maybe I’ll work at the Hurricane Center when I retire- that would be totally awesome! Oh a NASA gig sounds good too! A student I’m coaching is interviewing for a NASA internship that has something to do with growing plants on the International Space Station. That would be awesome as well! What do you see as the biggest challenge facing your industry today? I don't know if this is the biggest challenge, but I worry that people don't find agriculture an exciting field to work in because we're so much more urban now. I get nervous thinking about whether we will be able to attract the brightest talent and the best to our industry. Agriculture is as exciting as technology, as health science, as being a doctor or engineer. I worry people don’t get enough exposure to agriculture these days to understand just how exciting it really is. As we move from a largely rural society into a more urban society, people get further and further removed from where their food comes from. I think in more recent years people have come back around to wanting to understand how their food is produced. There's been some energy around local food movements and organic production and I welcome those conversations. What kind of advice would you give to a young person that is interested in science and technology? It's never been easier to go out and talk to people who are working in fields that you might be interested in. Go talk to people working in areas that you may not have considered. I’m a great example of somebody who fell in with a group of scientists and I didn’t know much about what they did, but I ended up have absolutely loving entomology. It became my career, even though it was nothing I ever anticipated. I would say go exploring and be open to new possibilities. Do you have a favorite book or something you’ve read recently that you really enjoyed? So many favorite books! I can only give you some off my list of top 10 and it changes all the time. I read a lot of classics. The Count of Monte Cristo is still one of my favorite books. Les Miserables, To Kill a Mockingbird, Little Women and yes, even Harry Potter books. I would hope that the work I was a part of here left meaningful solutions to make the world a better place. I'm a very small piece of energy in the world. As an individual I don't know what kind of impact that will leave, but I do know that the power of the collective effort that I've been part of in this organization has changed people's lives and that's what I want to leave.